Chicken Kiev is at once a decadent and relatively simplistic dish -- especially if you put it together the night before. Many supermarkets and other food purveyors today sell pre-made chicken Kiev that comes pre-assembled and ready to cook. 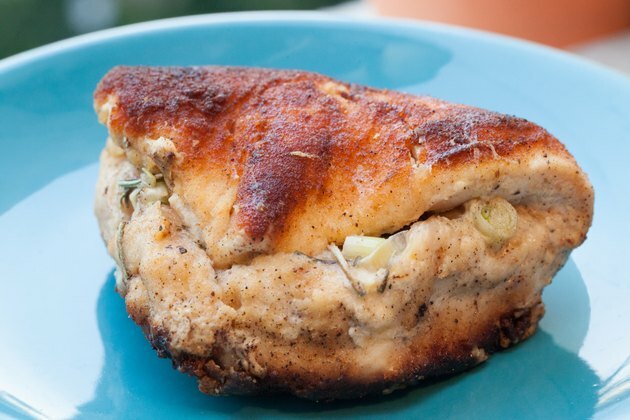 The dish consists of breaded, deboned chicken breast stuffed with herb-seasoned butter and is typically cooked using moderate-heat pan frying. While cooking, it is important to handle the delicate breading carefully and refrain puncturing the chicken -- you want the delicious crust and buttery stuffing in your mouth, not left in your frying pan. 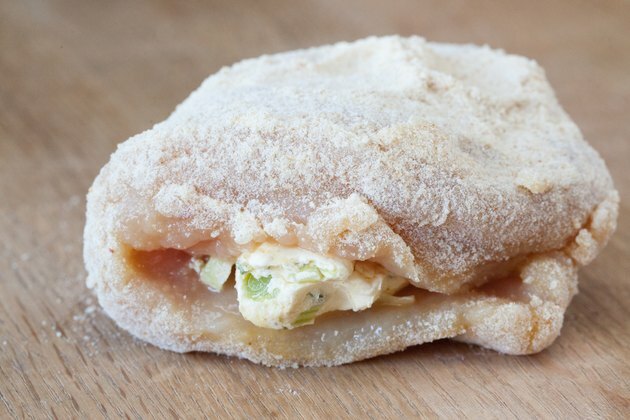 Ensure that the pre-made chicken Kiev has been in the refrigerator for at least 2 hours before cooking. Refrigerating will help solidify the butter in the center and reduce the chance of, or the amount of, flavorful butter leaking out during cooking. 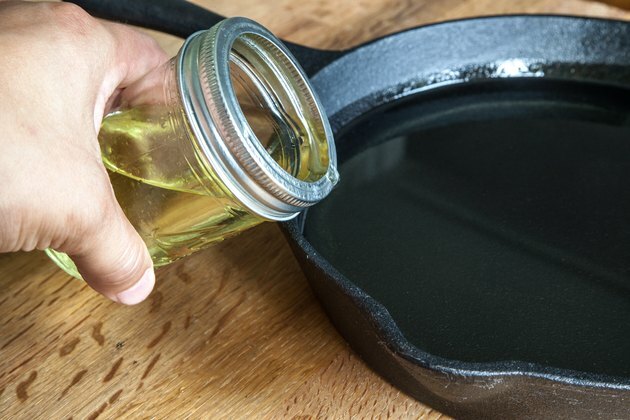 Pour 1/2 inch of cooking oil into a large, straight-sided frying pan or skillet. Set the heat to medium-low. Heat the oil to about 325 degrees Fahrenheit when tested with a deep-fry thermometer. 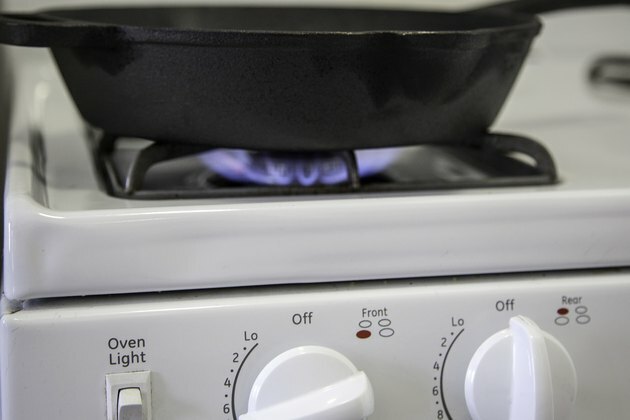 Check frequently and adjust the heat as necessary to maintain that temperature during cooking. Carefully add the pre-made chicken Kiev to the pan using tongs. 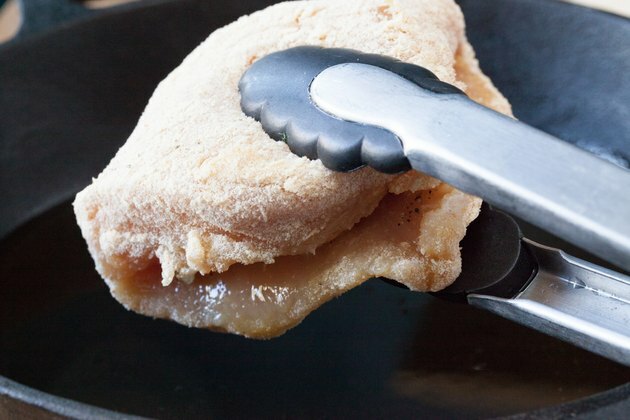 The best way to add chicken to a hot oiled pan is to hold the thicker end of the chicken with tongs and insert the chicken slowly, starting with the thinner end first. This will reduce the chances of splattering or splashing hot oil. 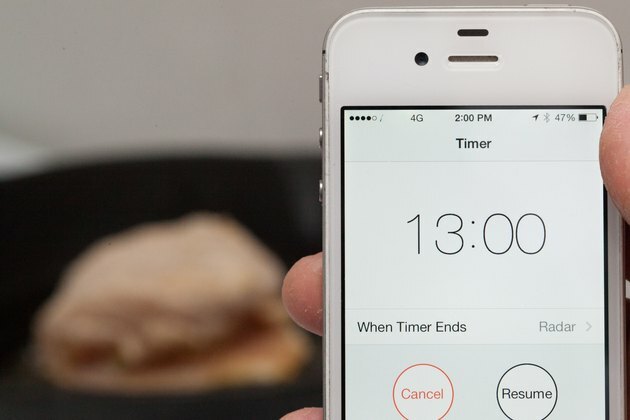 Cook the chicken for 10 to 13 minutes, flip it over and continue to cook for an additional 10 to 13 minutes until it reaches an internal temperature of 160 F. To check the internal temperature of the chicken Kiev, insert the meat thermometer into the chicken only; do not pierce through into the buttery center -- you want to check the temperature of the meat, not the temperature of the hot butter in the middle. Remove the chicken from the pan onto a wire rack set over a sheet pan, or a platter lined with paper towels, and serve after 5 minutes. Piercing all the way through the chicken -- with tools such as meat thermometers and forks -- can cause the butter and seasonings to leak from the chicken. 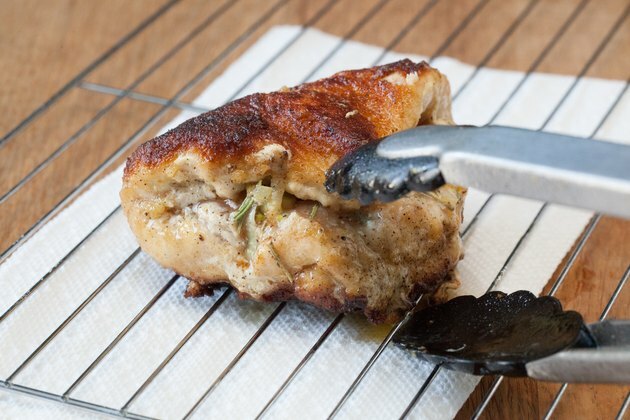 Always use tongs to flip the chicken and be careful when inserting a meat thermometer into the chicken. To minimize the risk of rupturing the chicken or inadvertently removing the breading, flip the chicken only once if possible. Paper towels have the occasional tendency to adhere to breading and possibly tear it from the meat, so a wire rack is strongly preferred. Pre-made chicken Kiev can also be cooked in your oven, however the exterior of the chicken will not be as crisp as the pan-fried version.To bake chicken Kiev in the oven, preheat to 350 F and bake the chicken Kiev on a wire rack set inside a baking sheet for 40 to 45 minutes until the chicken reaches 160 F. Remove the chicken from the oven and allow to rest for 5 minutes before serving. The USDA recommends a safe internal cooking temperature for chicken of 160 F. However, longer cooking times and higher heat will increase the chance of the chicken Kiev rupturing. The choice is ultimately up to you. Can You Boil Chicken First Before Frying? Is Broiling or Baking Chicken Healthier?